You do the same exercise week in and week out without thinking about it and without varying up the intensity or the duration. You aren’t exercising at all. You’ve hit a plateau with your weight loss. A rut often means you won’t see results because your body knows what to expect. In order to see weight loss or added muscle, your body needs to be surprised once in a while. Change up the types of exercise you are doing. Take your intensity up a notch. Or add some time onto your workout. Make sure you aren’t always choosing steady state cardio. Add some interval training. Are you skipping any type of strength training? 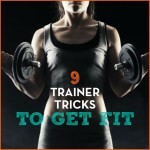 Add a group fitness class that focuses on muscle building, or use your own body weight to do some muscle-building moves. If you feel bored with what you are doing or you haven’t exercised in a long time (a sedentary rut!) go on a quest to find a form of exercise that appeals to you and your personality type. Sounds obvious, but if you love it, you will do it. Grab a friend or family member to exercise with you if that’s what gets you up and going. A rut is that definition of insanity that Einstein wrote about—it’s doing the same thing over and over expecting a different result. Don’t do that! Opt for a healthy routine instead. You are consistent with healthy habits. You regularly aim for seven hours of sleep. You wake up early to exercise. (It’s okay if you exercise at other times of the day instead, but people who wake up to exercise tend to do it more often. The day doesn’t get away from them, so they are less likely to skip! You have a system or framework for the amount of exercise you get each week, but you mix up what you do, the intensity in which you do it, and the duration. You devote time to cardio and strength training. You know what works and what doesn’t and you keep doing what works. Ask your fitness friends what they do for exercise. You might stumble upon a new idea you love. Challenge yourself to up the intensity. Buy a new fitness DVD. Be brave and try a fitness class you’ve always wanted to try. Select a weekend activity to do with your family. Join my recipe community for healthy meal ideas. Explore your community. Can you hit some new trails or go hiking nearby? Is there a park where you can take a long walk? One of the most important things about living a healthy lifestyle is to make it interesting enough that you want to keep living it. So do yourself a favor and if you feel stuck in a rut, dig yourself out! There are so many ways to mix up your workouts. You can find a form of exercise you love. And you shouldn’t be bored with healthy recipes. There are so many delicious and nutritious options at your fingertips. Make sure you spend some time varying up how you move your body and what you put into it. You will love the feeling from a healthy routine and being out of that dreadful rut. Yeah You! If you just use your common sense and do what makes good sense, you would not need to read all the things people say to get you out of a rut. Do not listen to what your body wants, but listen to what is good for your mental attitude. Read the Book of Proverbs in the Bible every day and you will have a good life and have wisdom to know what is right and wrong to do. You don't need 50 books and seminars to figure out what to do. The Bible is the answer to all your problems and frustrations.